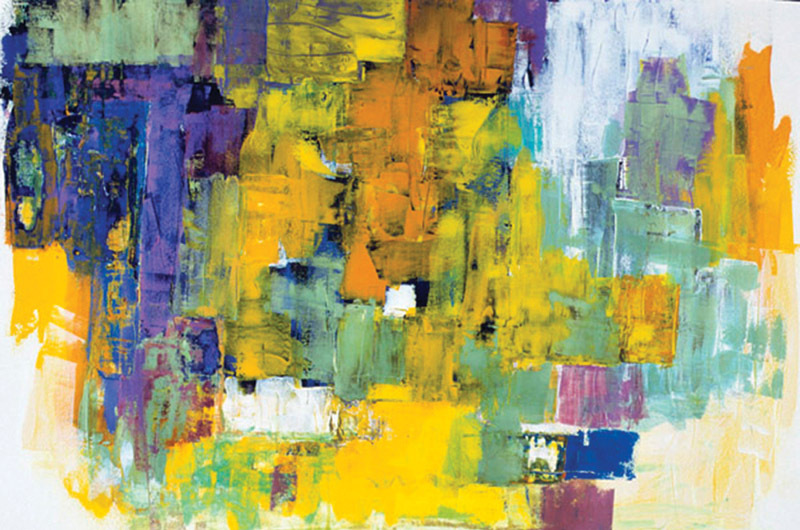 A garden lives on in memory of the painter who created it. There is no grand, sweeping approach to the Feldman house. There is, however, a red, white, and blue antique gate with thirteen stars, an LGBT flag, and a whirligig that bobs in the wind. Gretchen Feldman discovered the gate at a fair in Maryland and had it brought to the Vineyard, where today it cheerily and patriotically informs visitors that they have arrived at the Chilmark home of Sam Feldman, and at the garden created nearly three decades ago by his late wife. “It’s a miraculous garden. It’s my best friend,” Gretchen Feldman, artist, textile conservator, art collector, and gardener, told the Boston Globe in 2007. 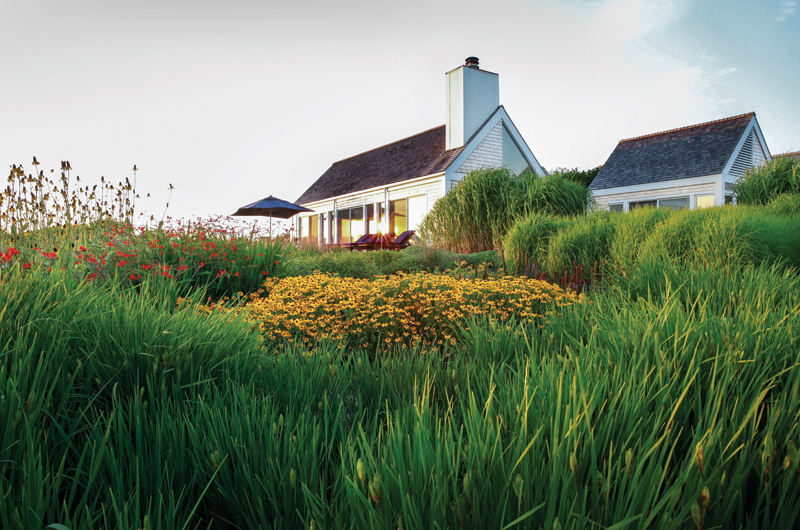 The 4,500 square feet of native and carefully planted ornamental grasses interspersed with bright perennials overlooks Tilton Cove, an inlet of Upper Chilmark Pond. Just beyond stretch ocean and dunes. “I get up every morning and walk through it to see how it’s doing,” she said. Although Gretchen died in 2008, the garden has been lovingly cherished and preserved by her husband, Sam, as a tribute to her, with help from Justen Ahren’s landscape team. The grasses and flowers around the house still attract goldfinches and barn swallows, which she loved, along with red-winged blackbirds and myriad butterflies. On and off over the last twenty-five years, a barn owl family has been in residence, but a bad storm some years ago drove out the owls and they have not returned. In summer, six goats forage and play in a field below the house, and George the sheep vies with them for attention. From the witch hazel of February to the silver grasses of September, the landscape provides color and texture all throughout the year. The three-bedroom house is old New England on the outside, but inside its living room, dining room, and kitchen flow together. Often, bouquets from the garden, artfully arranged by Marilyn Meyerhoff, Sam’s companion in recent years, decorate the rooms. Light streams through skylights. There are sliding glass doors that afford a view of grasses and cove, ocean and dunes along the south side of the house. In the southwest corner is Gretchen’s old studio, also with a view of the cove and the ocean. Although she did not precisely paint that view in her watercolors, the tawny shades of it are often in her paintings. Single-story though the house is, it still serves as a needed windbreak to protect the garden: both garden and house are little more than 1,500 feet away from the sea. Also shielding the flowers of the garden from ocean winds are sedges, Yaku Jima silver grass, and Malepartus silver grass. Oehme was famous for introducing these and other grasses, such as tall purple moor grass and autumn moor grass, to the American planting palette. It isn’t always enough: sixty anemones had to be replaced a few years ago after a particularly harsh winter. The garden is not one of those Island landscapes designed only for the high season of summer. To welcome spring in the warm days of February and March, long before the shad or forsythia bloom, there is a witch hazel tree with its bright yellow flowers in the front yard. To greet May, just as the garden’s sweet bay magnolia comes into leaf, purple Siberian iris bloom in the dooryard garden. An autumn olive and a thornless honey locust are also dooryard trees. Beneath them, a gleaming kinetic metal sculpture, Tiltable Column of Five, by George Rickey, stirs in the wind. Gretchen Feldman, Wildflowers, 2003, watercolor on paper, 25 1/2 x 40 inches. Long-blooming perennials such as day lilies and elegant ground covers such as lady’s mantle provide color among the grasses from spring till fall. In early summer, at the back of the house, yellow yarrow – familiarly called Coronation Gold – sweeps up to the deck. Then there is gold again as summer progresses and Stella d’Oro blooms. Autumn brings the light-capturing iridescence of Japanese silver grass amid a flowing carpet of daisy-like chrysanthemum Pacificum. Off the deck, pretty little white asters blossom while lavender flowers perfume the air. A narrow path at the side and back of the house separates the tended garden from its wild surroundings. There, pokeweed with its bright berries and mauve Joe Pye-Weed, goldenrod, and Queen Anne’s lace hold court. Gretchen was ahead of her time in her appreciation of these plants, which many of her contemporaries would have eliminated as weeds. She realized that they provided food for birds and butterflies. She also encouraged white Indian feather and orange butterfly weed, a favorite of monarch butterflies, which have been in severe decline. At the back of the house is also a small herb garden. There are sounds in the garden too, of course – the cawing of crows, the music of songbirds, the call of the Canada geese sweeping overhead, the buzzing of bees gathering pollen, the rustling of the grasses, the sighing of trees. Fall is coming, they seem to say, and behind it winter. On both sides of the colorful gate the species come and go with the seasons. But in the garden the memories bloom uninterrupted, carefully tended by Sam. I tend to these gardens with a small crew , working for my brother, Justen Ahren. It's an honor and a pleasure. It's Truly a year round garden that delights the beneficials and wild life and in the Summer the visiting goats they keep in pasture.